Quite contrary to the narrow streets of the Barri Gòtic is the L'Eixample district (pronounced: laschampla). Around 1850, with the beginning of industrialisation, Barcelona began to grow over the city walls to extend the living and working place for the fast-growing population. During this time, the distinctive checkerboard pattern of L'Eixample (extension) was designed by the city planner Ildefons Cerdà. Cerdà had the floor plans of American cities as a model. Cerdà saw the streets with wide and generously extended crossings (Passeig de Gracia has six lanes), to highlight the crossings were blocks to the chamfered corners. The blocks are all square and have a big yard, but most of today is built. From the original idea Cerdàs, there is plenty of green for the residents to provide very little remains. 1859 was the controversial development plan approved by the town council. The middle part of L'Eixample is often called "Quadrat d'Or", golden square, describing the elegance of this area. The north main road leading Passeig de Gracia connects the medieval city with the artist Gràcia district and is lined with chic boutiques and upscale restaurants. 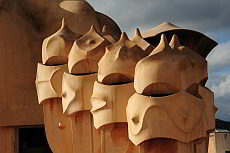 Two of the most famous monuments of Barcelona's most famous citizen Antoní Gaudí can be done at Passeig de Gracia admire the Casa Millà and the Casa Balló. 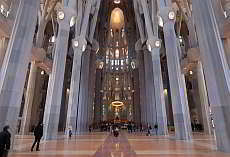 Farther east, the Sagrada Familia cathedral. Overall, the square d'Or about contains 150 historically protected buildings. The Eixample is dominated by the buildings of the Catalan Art Nouveau, the Modernism. 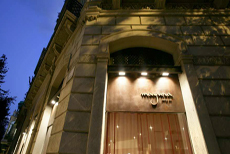 In the Eixample, especially restaurants with traditional Catalan and Spanish cuisine are located. But also good international restaurants. The most famous landmark of Barcelona by Antoni Gaudí amongst others. 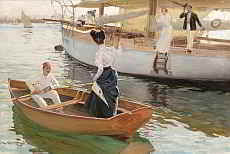 Is being worked on since 1883. Whoever comes to this structure, is for sure one thing: fascinated. 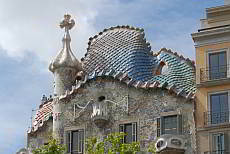 The roof of the Casa Batlló looks like a dragon back. On your vacation you usually don't want to visit a hospital. However as a tourist you should not miss this hospital. 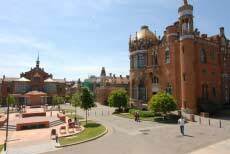 The Hospital de Santa Creu i de Sant Pau for sure is worth a visit. 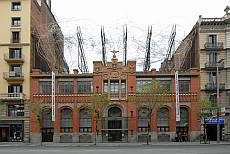 The Fundació Antoni Tàpies houses the works of Barcelona's most important artist after Miró. The building with its crown of wire mesh is recognised from far away. The Museu del Modernisme Català (MMCAT) is dedicated exclusively to Catalan Art Nouveau. It is located in a modernist residential and factory building. On the ground floor there are mainly furnishings from the modernist era, such as cabinets, dining tables, wardrobes and other artfully designed everyday items. In the cellar of the former factory building, you will find the painting and sculpture collection. 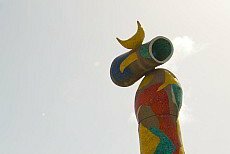 100 meters away from the Plaça Espanya is the Parc de Joan Miró with his quite unusual sculpture. 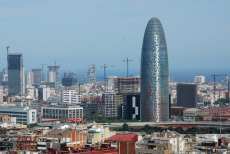 The 142 metres tall office tower is Barcelona’s latest attraction. Depending on the incidence of light, it shimmers in all different colours; at night it is even illuminated. 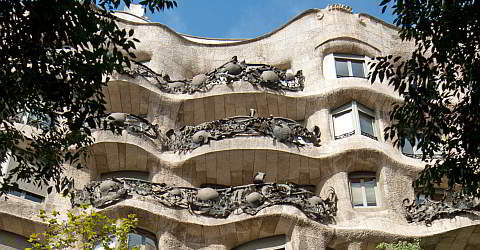 Book tickets for the Casa Batlló, one of the most beautiful buildings in Barcelona. No standing in line. Every Friday and Saturday great concerts take place in the Museu Europe d\'Art Modern.